Antisemitism from Muslims has become a serious issue in Western Europe, although not often acknowledged as such. Looking for insights into the views and rationales of young Muslims toward Jews, Günther Jikeli and his colleagues interviewed[:] 117 ordinary Muslim men in London (chiefly of South Asian background), Paris (chiefly North African), and Berlin (chiefly Turkish). The researchers sought information about stereotypes of Jews, arguments used to support hostility toward Jews, the role played by the Middle East conflict and Islamist ideology in perceptions of Jews, the possible sources of antisemitic views, and, by contrast, what would motivate Muslims to actively oppose antisemitism. They also learned how the men perceive discrimination and exclusion as well as their own national identification. 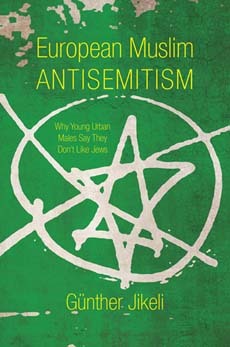 This study is rich in qualitative data that will mark a significant step along the path toward a better understanding of contemporary antisemitism in Europe. 360 pp., 7 b&w illus.